The 50th Sydney Film Festival runs from 6 to 20 June 2003. Program information and ticketing is on the website. The ‘Persistence of Vision’ symposium, which commemorates the Festival’s 50-year anniversary, will be held on Tuesday 3rd and Wednesday 4th June at the University of Sydney. For further information, contact Melissa McMahon. At the beginning of the 1950s in Australia, non-mainstream films were mainly seen thanks to the film societies which were growing in both number and size, particularly in NSW and Victoria (in NSW, there were five film societies in the Blue Mountains area alone) and which borrowed films from the libraries of the recently set up State Film Councils. And it was at a meeting in 1950 of the Australian Council of Film Societies, at the Sydney beachside suburb of Newport, that serious talk of an Australian film festival first occurred, perhaps inspired by the establishment of the Edinburgh Film Festival in 1947, a non-competitive festival (unlike established events such as Venice and Cannes) where audiences could see a range of otherwise inaccessible films. Those in attendance at Newport decided that their next conference should also feature a film festival, and in January 1952 about 800 people attended the first Australian Film Festival, at Olinda in the Dandenongs outside Melbourne. Screenings were held in church halls, the Town Hall, and the Mechanics Institute; films included Flaherty’s Louisiana Story (1948) and Dovzhenko’s Earth (1930). It was a great success, making many of those in attendance think of starting a regular festival in their home city (in fact, Melburnians were quicker off the mark and held their first festival in March, 1953). Returning from Olinda determined to start a film festival in Sydney, a number of people got together and formed a committee with Alan Stout, Professor of Philosophy at Sydney University, as chair, and active members including filmmakers John Heyer and John Kingsford Smith and Sydney University Film Group President David Donaldson. The first formal meeting was held at the offices of the National Film Board of Canada (an important hub of the local film scene), and was attended by a wide range of interested individuals and representatives of organisations, including the NSW Federation of Film Societies, the Federation of Parents and Citizens Associations, the Independent Film Group, the Australian Amateur Cine Society, the Film Users’ Association, and the Sydney Scientific Film Society. 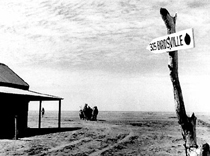 They had no operating budget or base of operations, so John Kingsford-Smith’s company, Kingcroft Productions, donated 25 pounds, as did the Rural Bank, while the NSW Film Council offered their facilities for film viewing and storage. It was decided to hold the first festival at Sydney University, and David Donaldson agreed to take on the role of director. In its 50 years, the festival has grown and changed enormously, reflecting the world around it. Film festivals are now held the world over (there’s barely a day in the year when at least one film festival isn’t happening somewhere). Australia now has four major film festivals, with Adelaide’s commencing this year, but the calendar is also crammed with smaller niche market events. The Asia Pacific Festival, Tropfest, the St Kilda Film Festival, Flickerfest, Queer Screen, Real Life on Film, the Jewish, Italian, Greek, Spanish and French Film Festivals all compete for audiences, films, and media attention, while smaller short film screenings run in pubs and cafés in every city in Australia. There are also many regular forums and seminars on film; ACMI in Melbourne is now programming a diverse slate of film and digital programs throughout the year; and the National Cinémathèque is rebuilding its circuit. There is easy access for Australian audiences to a much more diverse range of material on video and DVD; World Movies, a dedicated channel of foreign, mostly subtitled films, screens on pay TV; while free-to-air television caters to a cinephile audience primarily through SBS, which offers a year-round selection of world cinema. And yet there are still cinemas we hardly know about and rich and valuable film histories that are barely touched on. Films are being made in all countries and by all peoples, lost films are being found, damaged films reconstructed: the more you see, the more you know you are missing! Despite all this, where the festival could once sell out all its subscriptions weeks before the program was finalised, audiences now are busier, more time-poor, and less willing or able to commit themselves to two weeks of dedicated film-going. Many wait for the program to select a more limited schedule of films to watch. The Sydney Film Festival once survived and even prospered on the income from its ticket sales; now, like festivals the world over, it needs an income in which sponsorship and government support play a growing part. The competition for material is particularly intense overseas, where most of the programming for the SFF comes from; international distributors are becoming more commercial in their approach to festivals, often demanding a film hire fee for higher profile films such as Cannes competition entries. It’s a challenge for festival directors to provide their audiences with satisfying programs in such a crowded and competitive landscape. As the festival’s 50th anniversary approached and a range of commemorative activities were planned, some of us were intrigued by the idea of a conference or seminar on the role and future of festivals within the wider film community: a way of looking at festivals then and now, and at how they will have to change to maintain their relevance. Two things energised our thinking. One was the practical, physical way in which festivals have had to become more professional, more competitive; the second was more intangible, and centred around such things as the love of cinema, the sense of location, and the festival as an occasion with its own community. A small committee was set up, and as we knew that it would be important to have an educational institution associated with the event, we approached Sydney University, the festival’s original partner. We were delighted when Professor Adrian Mitchell, Head of the Faculty of Arts and Humanities, enthusiastically welcomed the idea and called a first meeting at the University. Ideas for sessions were bounced around but some sort of consensus almost immediately emerged, which has been refined in the months of organisation since. There will be a retrospective session on the history of the festival and the relationship between it and the University, touching on film, biography, memory, and history. The changing role of the concept of festivals, and the increasing need for them to be professional, will be explored in a session we’re calling “The Business of Festivals,” which will analyse the relationship between commerce and content, with a panel featuring keynote speaker B. Ruby Rich. For many Australians it was probably the Sydney Film Festival where they first got to see Japanese – or any Asian – films; these films have been one of the strongest threads in the history of the festival, so we’re paying tribute with a session on Asian cinema and are extremely fortunate to have the renowned Japanese cinema scholar, Professor Aaron Gerow, joining this panel. Cinephilia, the love of film, is an essential that lies at the heart of a film festival, and it does at this symposium as well, with Australia’s internationally acclaimed film writer Adrian Martin teasing out the issues surrounding this topic with other film lovers. The symposium would not be complete without a session on documentaries, which often get their breaks at festivals and yet today can’t get funding or presales unless TV companies commission them. Nor could we forget the role that festivals play in the lives and careers of young filmmakers, and we’re happy to be sharing this session with the Australian Film Television and Radio School, celebrating their own 30th anniversary this year. And screenwriter Louis Nowra’s new book, an illuminating discussion of Nicolas Roeg’s Walkabout, will be launched during the symposium by filmmaker Rachel Perkins. In fact, there were so many ideas that there simply wasn’t the time or space to include them all; issues such as indigenous cinema, the dangers posed to local production by the Fair Trade Agreement with the USA, and the growing threat of film piracy will be discussed at forums during the festival itself.